This baking powder biscuit recipe will impress you and your family. It produces huge biscuits that are flaky and so tender - fill them with fluffy scrambled eggs, bacon and cheese. Smothered in butter, or pour my awesome sausage gravy over them. 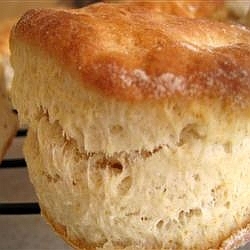 If you are looking for a soft BIG biscuit - it's your lucky day. PREHEAT oven to 425 degrees. You will need a baking sheet. In a large bowl, whisk together the flour, baking powder, salt, and sugar. Cut in the shortening until the mixture resembles coarse meal. Gradually stir in milk until dough pulls away from the side of the bowl. Don't over-mix the dough once you add the milk and only pat together (no real "kneading" or they will be tough). Turn out onto a floured surface and pat or roll dough out to 1 inch thick. Cut biscuits with a large cutter or juice glass dipped in flour. Repeat until all dough is used. Brush off the excess flour, and place biscuits onto an ungreased baking sheet. Brush the melted butter over the biscuits and bake for 13 to 15 minutes or until edges are golden brown. Brush again with butter and stand back. There will be a stampede to get to these cat heads.